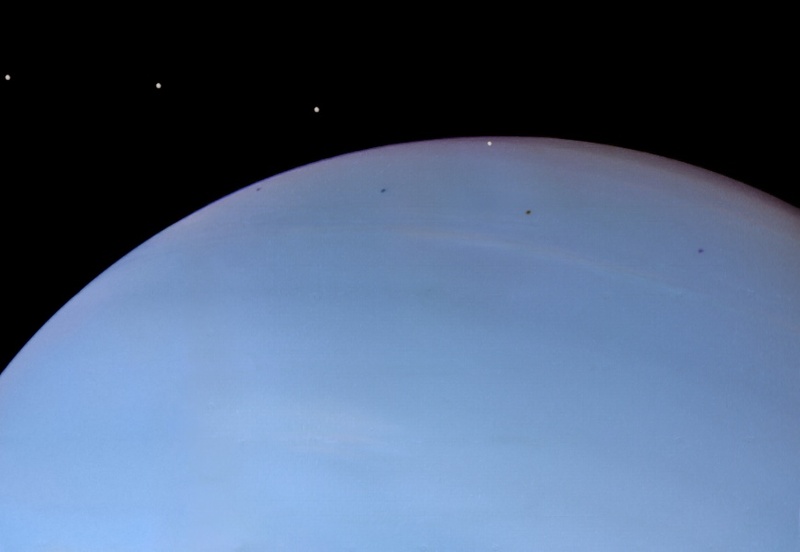 Discovered by philosophy professor Ted Stryk in the archives of Voyager 2 image data, four separate images were combined to show the shadow of Despina – lightened for better visibility – crossing over the sky blue face of Neptune. Neptune, now officially the outermost planet in our solar system, was visited by Voyager 2 in August of 1989 during its tour of the outer planets. The four images used to create the composite shown here were taken on August 24, 1989, nine minutes apart. They had not been considered of much importance until Stryk noticed that they showed the shadow of 91-mile-wide Despina on the cloudtops of Neptune’s northern hemisphere and, in the fourth frame, the moon itself crossing the face of the planet. Neptune is the fourth largest planet in our solar system and boasts the highest wind speeds yet found – 1,250 mph winds scream through the skies of this gas giant! Its color comes from its atmospheric composition…hydrogen and helium are invisible, but methane absorbs the red spectrum and so it appears blue. Like the other gas planets Neptune has a system of rings, although nowhere near as extravagant as Saturn’s. It has 13 known moons. Great find Ted, and congrats for your Astronomy Picture of the Day!